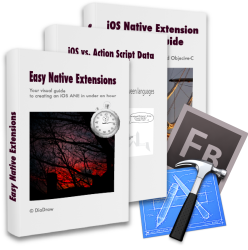 Among all the new content and code examples, the second edition of Easy Native Extensions comes with a whole additional book on converting data between ActionScript and native code for iOS. Buy any package before the end of this month, June 2015, and you get the source code of our iOS + Android ANE Template free (priced at $99). Here is a table which will help you decide which package is best for you: Padawan, Jedi Knight or Jedi Master. New here? No idea what we are on about? Read about our eBooks here. Drop us an email at office@diadraw.com.